Tonight’s film is an historically accurate dramatization of events surrounding the 1919 World Series, which the Chicago White Sox deliberately lost to the Cincinnati Reds. John Sayles (director of the labor film classic Matewan) adapted the screenplay from Eliot Asinof’s 1963 book, Eight Men Out, which he closely follows. While both the book and the film explore the motives and actions of the players, gamblers and others involved in the fix and its aftermath, they differ in assigning responsibility. Where Asimof has the players suggest the fix to the gamblers, Sayles shows the gamblers at the outset discussing which players might be approached to throw games. Sayles presents the players more sympathetically — their behavior looks more like a labor action than an expression of personal greed. 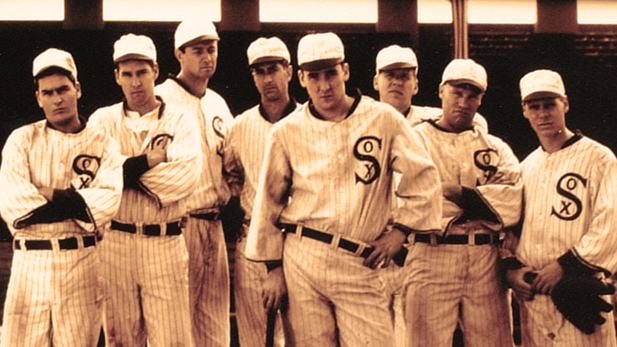 To appreciate Eight Men Out as a labor film it is helpful to see how the players’ decision to throw the World Series grew out of the terms and conditions of their employment. In 1919 major league players were essentially the property of the owners of baseball clubs. Thanks to the reserve clause in their contracts, their clubs retained the perpetual right to their services. As they were not free to negotiate with other clubs their choice each year was either to accept the salary offered them or to quit baseball. Conversely, they had no job security: injured players had no protection, players might be fired with ten days notice, and there were no pensions. Thus, early in the 1919 season when the White Sox team threatened to strike over the low pay offered them by owner Charles Comisky, they were only dissuaded by the promise of bonuses. But Comisky reneged on his pledge, rewarding his pennant winners not with cash but with a case of champagne and benching pitcher Cicotte to prevent him from winning the stipulated 30 games. On top of this, Comisky was a skinflint, paying his players salaries lower than those received by less-skilled players on other teams; paying less for their meals, having their uniforms laundered less frequently (hence the White Sox being called the Black Sox). With such grievances, especially in the face of increased box office receipts and franchise profits, it is not surprising that some players might sabotage the series to undermine their owner and recoup some of their lost income. Attempts by players to litigate the reserve clause out of their contracts proved unsuccessful. In 1922 the Supreme Court ruled that baseball could not be federally regulated, Justice Oliver Wendell Holmes writing that “personal effort, not related to production, is not a subject of commerce.” As late as 1972 the Supreme Court (Flood v. Kuhn) upheld the reserve clause and it was not until 1975 that the players’ achieved, through arbitration by their union, the status of free agents with some control over their professional destinies. Baseball players and owners of baseball teams were not the only workers and employers clashing in 1919’s post-WWI economy. As war contracts ended and war-related production dwindled, as workers drafted into military service were demobilized and returned to the civilian workforce, and as the cost of living rose dramatically, tensions between labor and capital led to 3,600 strikes involving over four million workers. Most notable were America’s first general strike (in which Seattle’s entire labor community, united in solidarity with the Metal Workers Union, walked off the job); strikes by 250,000 steel workers and 400,000 UMW coal miners; and strikes in New England by 40,000 textile workers and 9,000 women telephone operators, as well as the entire Boston Police force. A race riot in Chicago, only half a mile from Comisky Park, was partly occasioned by the layoff of unionized black stockyard workers, a story told inThe Killing Floor, a film we’ve shown in our labor film series. Employers, the press and the government attributed the growing labor militancy in 1919, not to the economic crisis precipitated first by the war and then by the armistice, but to the Russian revolution and to such organizations as the Industrial Workers of the World (IWW), the Socialist Party (some of whose members were winning elections), and even the Communist Party (founded in Chicago in 1919). Among the responses to perceived subversion were the Congressional founding that year of the American Legion, the attack by Legion members on the Centralia (WA) IWW hall and the murder of Wesley Everett, and the raids launched by Attorney General Palmer on the offices of radical groups, beginning with Buffalo. In Rochester, police raided the Progressive Working People’s Lyceum on St.Paul Street, arresting three alleged anarchists and seizing the library. As you watch and, I hope, enjoy Eight Men Out, please note the performance of John Sayles as Ring Lardner who was, in 1919, a syndicated sports writer who, in disgust over the World Series fix, abandoned baseball altogether. Also note that Hugh Fullerton, played by Studs Terkel, was the sports writer who exposed the fix in the Chicago Herald-Examiner. Another figure, National League president John Heydler, is played by Eliot Asinof, author of the book on which the film is based. Finally, keep your eye out for the union shop card in the window of the barbershop where one of the players is being shaved. This entry was posted in English Language on September 18, 2015 by Jon Garlock.